As bitcoin slowly filters its way into the mainstream, one of the minor, nagging issues has been the virtual currency’s symbol. The “double-dashed B” isn’t part of the Unicode Standard character set, meaning that there is no universally accepted symbol to indicate bitcoin in computer code. Most bitcoin amounts are indicated with BTC (or, less frequently, XBT), as in 100 BTC. This puts bitcoin at a slight, but meaningful disadvantage over dollars ($), euros (€) or the yen (¥). The closest Unicode symbol, ฿, is reserved for the Thai bhat currency and only includes a single vertical line. Although there are some groups pressing for Unicode to update its standard to include the bitcoin symbol, French design company ECOGEX has proposed an alternative solution: The “Ƀ” symbol in the existing Unicode set. This symbol, not widely used for anything, is described as “latin capital B with stroke,” and already has the keyboard shortcut Alt +0243. A number of bitcoin-related companies have already adopted the symbol, including ZeroBlock and Lamassu, but thus far the bitcoin community has been highly resistant to the concept of changing the symbol. 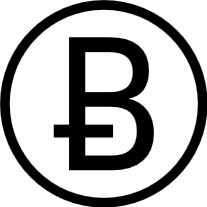 Given that the current symbol is a direct contribution from mysterious bitcoin creator Satoshi Nakamoto, controversy is to be expected. The proposed new symbol faces a tough battle for acceptance, needing to win over not only the existing user base, but also the Bitcoin Foundation and the Bitcoin Core team.